Heavy machinery can be difficult, and sometimes hazardous to relocate; that’s why you need the help of a professional machinery transport company. Whether you have a digger, grader, bobcat, excavator or other earthmoving equipment, a tractor or other piece of farm gear to move we can assist you in finding the right company to transport it. 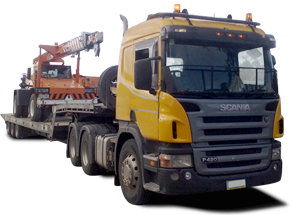 At towing.co.nz, you’ll find towing companies with the right equipment required to safely transport your heavy machinery, and helpful professionals who will use the correct loading and securing procedures. Temporary storage services are also available – just search our directory for your nearest machinery transport company. What types of tow trucks are used for machinery transport? Slide Decks (Flat Beds) are trucks fitted with a flat metal deck that is hydraulically inclined and lowered to ground level, enabling the equipment to be loaded onto it either by being driven or winched onto the deck. The deck is then returned to the transportation position. Slide decks are also useful for towing lowered vehicles, accident damaged vehicles, trailers, caravans, breakdowns and motorbikes. Mid-Range Transporters come in a range of sizes and can transport mid range machinery. They are also suitable for campervans, light commercial vehicles, and long wheel base vehicles. The type of transporter required will depend on the weight, length, width, height and condition of the machinery. Heavy duty low-loaders are equipped for all shapes, sizes and weights for machinery transportation. Our towing directory includes listings for car towing, truck towing and breakdown assistance companies. region to find a towing company to assist you.